These were on my SS, I bought them back in 1997 , the left one is cracked in the same spot that the right one broke. Luckily it broke near the top of the hill so I was able to ride back down with only one crank.. But that was after towing the trailer around pedalling with one leg from log to log clearing deadfall off the trail system. Think I should go home and check my cranks for cracks. Those cranks came on my Stumpjumper. They're on my wife's Cannondale now (not too worried as she only rides it about twice a year). Thanks for posting that....I have a pair of those on my hardtail, and of course DID think they would last forever. I will be inspecting for cracks tonight! but it happened to me too. I had some old Shimano cranks on my SS and the drive arm broke just above the spider. I tossed them in the recycle bin. I did not even bother to take pics. I figure I don't want a warranty claim...just want a better and stronger crank. That is pretty much what I do any time I break something...replace it with something better, stronger, and usually heavier. Glad you did not get hurt. These were the "better" version the Strongarm cranks. my '96 stumpy came with the cheaper "son of strongarm" version which is heavier and didn't have the "S" logo engraved into the crank, I think I bought these on clearance from Nashbar in '96 or '97 when I mangled the original left crank with a cheap crankpuller. I'm now using the older righthand crank from that original set and a replacement left crank (made by Sugino) that looks identical, I had them in my parts box, I almost gave them away at ACM.. now I'm glad I didn't. I have the exactly same Specialized cranks sitting somewhere buried in my parts bin. Stopped riding them because they scared me - I'm only 160lbs and they still felt like wet noodles to me. Looks like it was a good decision to replace them. You should post a view from the side so people can see just how THIN they are! Yeah the 1 year warranty is gonna be so useful on the 10 year old cranks. Back in the fall I bought the Crank Brothers Cobolt SL crank set. The bond between the aluminum and stainless steel seperated. They're sweet looking...that is about it. Luckily Crank Brothers has an excellent warranty dept. They sent me a new set which is currently collecting dust. 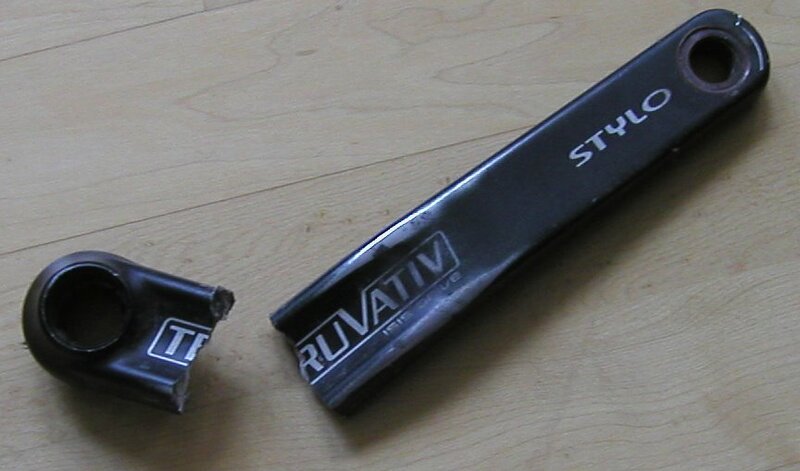 I've heard the early Truvativ Stylo's had breakage issues from Webcyclery, but they also said it was cleaned up. I have some Stylos on a Surly, and was encouraged by one rider to check the serial number and verify w/ Truvativ that they were post-issue, however I never did. Not sure if there was a recall, and if there wasn't, how candid the mfg would be about issues.